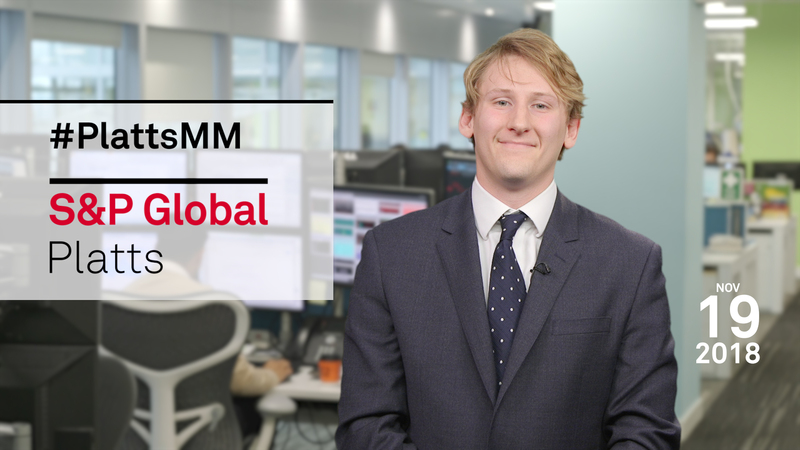 In this week's Market Movers: Winter sends its first chill through the power and sugar markets, while the palladium market will look for news from Arctic Russia. First off, the oil market will be seeking a new sense of direction after last week's volatility, in which Dated Brent briefly dipped below 65 dollars a barrel for the first time since March. Where do you see oil prices heading by the end of 2018? Tweet us your thoughts with the hashtag #PlattsMM. In European power markets, prices have been heading higher as the continent is set to get a first taste of winter this week. The weather combined with the weaker pound has also pushed UK natural gas hub prices below their Belgian counterparts. The cold spell in Northwest Europe will also hit the continent's sugar-beet belt. Several nights of frost are expected, which could damage beet still in the ground. Meanwhile, the power and generating fuels markets will also be keeping an eye on the political turbulence in the UK sparked by the Brexit deal struck with the EU. And finally, in metals, the palladium market too will be seeking clarity. It will be looking to Monday's investors' day by Russia's Norilsk, the world's largest producer, with analysts hoping to gain a clearer picture on supply. In this week's highlights: Winter sends its first chill through the power and sugar markets, while the palladium market will look for news from Arctic Russia. But first: Oil market participants will be looking for more information on supply of Russian Urals crude for the whole of December. On Friday, loading for just the first six days were released. Refiners are likely to be looking for heavier, sour crudes, such as Urals because of a bullish high-sulfur fuel oil market and low naphtha prices compared with crude. Grades like Urals produce a higher proportion of heavier refined products, rather than the lighter basket of crudes that make up Dated Brent. These North Sea crudes are more abundant in lighter products such as gasoline, naphtha and diesel. Overall, the oil market will be seeking a new sense of direction after last week's volatility, in which Dated Brent briefly dipped below 65 dollars a barrel for the first time since March. The low came as US President Donald Trump urged OPEC not to cut output. On Friday, the Iraqi government restarted exports of Kirkuk crude oil through the Kurdistan-Turkey pipeline. That could pave the way for a rise in loadings from OPEC's second-largest producer. That's the focus of this week's social media question: Where do you see oil prices heading by the end of 2018? Tweet us your thoughts with the hashtag #PlattsMM. In European power markets, prices have been heading higher as the continent is set to get a first taste of winter this week. The cold will be most sharply felt in Belgium and France, where peakload power prices have already risen above 100 euros per megawatt-hour. French peak demand is forecast to rise above 80 gigawatts this week for the first time this winter, up from 66 gigawatts last week. Maintenance at French and Belgian nuclear reactors has removed key supply, so wind generation in Germany will be crucial. However too much wind power generation could cause issues on the German power grid. It is not only the power markets which will be eying the cold weather in Northwest Europe. The cold will hit the continent's sugar-beet belt. Several nights of frost are expected, which could damage beet still in the ground. The dry weather in the summer and autumn has already reduced the beet and sugar yield, causing production estimates for the season, which started in October, to be revised down. The weather combined with the weaker pound has pushed UK gas hub prices below their Belgian counterparts. This has made bookings on the Interconnector gas link economic in time for Monday's capacity auction. The NBP-Zeebrugge spread for December delivery has moved above 5 pence a therm. This has resulted in rare interest in booking capacity on the Interconnector gas link in the winter. Normally gas moves from Belgium to the UK at this time of year. The power and generating fuels markets will also be keeping an eye on the political turbulence in the UK sparked by the Brexit deal struck with the EU. After several ministers resigned last week, concern is growing that parliament might be unable to ratify the deal or that Prime Minister Theresa May might be ousted by her own party. Fears the outcome could be the UK crashing out without a deal caused EU carbon allowance prices to plunge 8% on Thursday. The palladium market too will be seeking clarity. It will be looking to Monday's investors' day by Russia's Norilsk, the world's largest producer. Analysts hope to gain a clearer picture on supply. Availability concerns have caused prices for palladium, used mainly in gasoline cars to help reduce emissions, to rocket by nearly 40% since August to an all-time high last week. Palladium has been in short supply since 2012. Prices were given a boost last year by the move away from diesel cars because catalytic converters for gasoline engines use more of the metal than their diesel cousins. Since then, it has thrived on recovering automotive production in many countries.